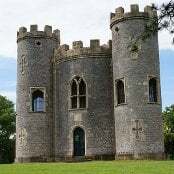 If you can't find what you are looking for, or no availability exists for your dates, please visit our sister website, www.bristolbedbreakfasts.co.uk, where you can see our range of bed and breakfasts and hotels in Bristol. Bristol is a city that is vibrant and full of history. Bristol also has a diverse cultural, artistic and scientific heritage. The graffiti artist Banksy was born in the city, his work displayed over much of it and some famous comedians also grew up in the area, such as Justin Lee Collins, Lee Evans and Russell Howard. In 'Old Bristol', The Palladian Corn Exchange, built in 1743, boasts a clock on its frontage that ingeniously tells time both in GMT and the old Bristol time. Nearby is the Castle Park housing the ruins of the castle. Up into Clifton there is the suspension bridge and fairly upmarket housing to admire with Clifton Downs to appreciate Bristol from. The Theatre Royal is the oldest continually operating theatre in England and the building itself is a Grade 1 listed building The city has its own zoo where a large variety of creatures are housed both here and in the aquarium. Bristol also has a large number of live music venues after the music scene grew rapidly after the 1970's. Around Bristol there are many historic houses and galleries that are open to the public. Bristol has a large international airport, with operators flying into Bristol from 112 different countries. It is 8 miles away from the city and easily accessible via the A38 or through the train and bus services that run to the city centre. Bristol has easy road access from London, less than two hours, as well as from the north and east of England, as it is situated at the intersection of the M4 and M5 motorways. National Rail serves from all around the country to Bristol, under a two hour journey from London. Once in Bristol, the city has plenty of fast and convenient bus services available from many locations such as Bristol Temple Meads train station and the city centre, run by the operators First. Bristol, the second largest shipping port outside London, is built around the confluence of the rivers Avon and Frome and is home to Brunel's famous Clifton suspension bridge. The city was believed to be founded in 1000, producing its own currency just 20 years later, however archeologists have found remains 60,000 years old in the area, suggesting people settled there a long time before the town was built. 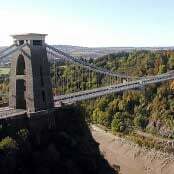 Bristol also gained a Royal charter in 1155 and was then granted County status in 1373. In the present day it is a very culturally alive city with endless displays of the arts, theatre and music and is seen as the gateway to the West Country. It's Floating Harbour is deemed the jewel in Bristol's Crown but there are certain historical treats amongst the medieval elements of 'Old Bristol'.